Handsome showy shrub 4-6 and spreading. Grows in yellow sand on ridges in tall open banksia shrubland in south-west Western Australia over limestone. It has thick bright green leaves, whitish stems and buttercup yellow flowers. 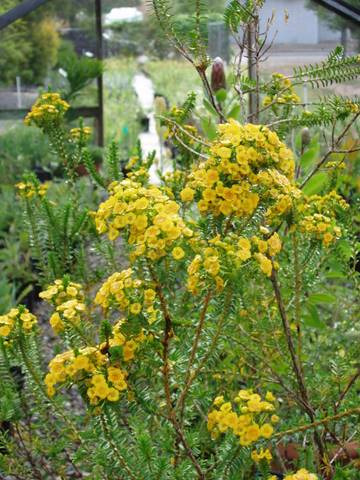 Very ornamental shrub for small or larger gardens. Pruning promotes compact habit. Propagates easily by cuttings.